2017 AOA White Color Champion! 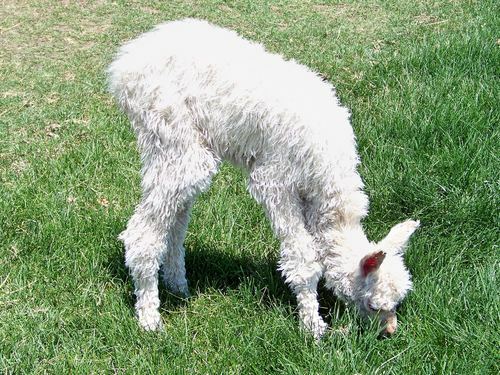 First cria from Goldyn Rae's Nazca. First offspring fleece - 2 days old! 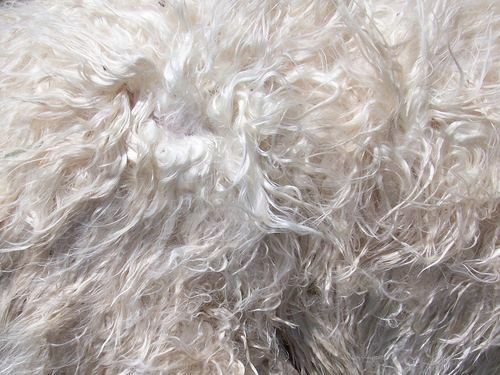 Lustrous and fine Alejandro fleece. Mont Blanc Genetics! 60.25 Density! Goldyn Rae Alpacas and Grandview Suri Alpacas are proud to welcome Mont Blanc son Alejandro to Colorado courtesy of Hasselbring's Harmony Ranch! Mont Alejandro won First Place and White Color Champion at the 2017 AOA National Show. 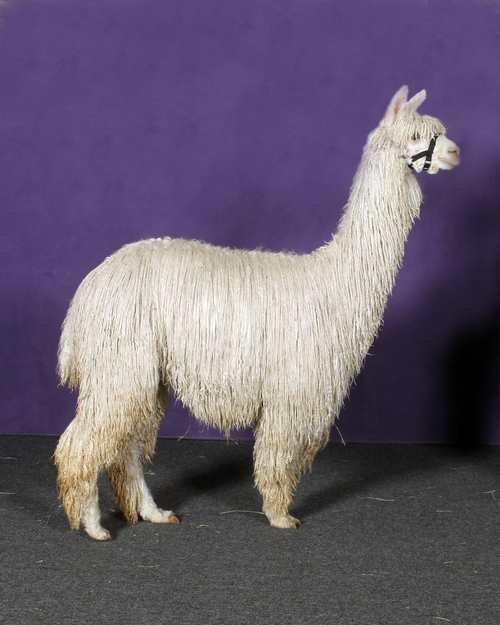 He is a gorgeous male with excellent luster, tons of fiber, and a gentle disposition. Alejandro's sire, HHSF Accoyo Lafite's Mont Blanc, needs no introduction! Mont Blanc boasts TOP 1% in 6 out of 7 EPD traits for the last 2 years! He won multiple Color Championships and Judge's Choice awards, was named Reserve Light Herdsire of the Year at the 2012 & 2013 Futurity, and has produced multiple champion-winning offspring. 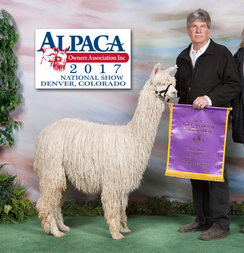 Alejandro's dam BBFAI Sierra Mist had a stunning show career herself, winning multiple Color Champion banners. 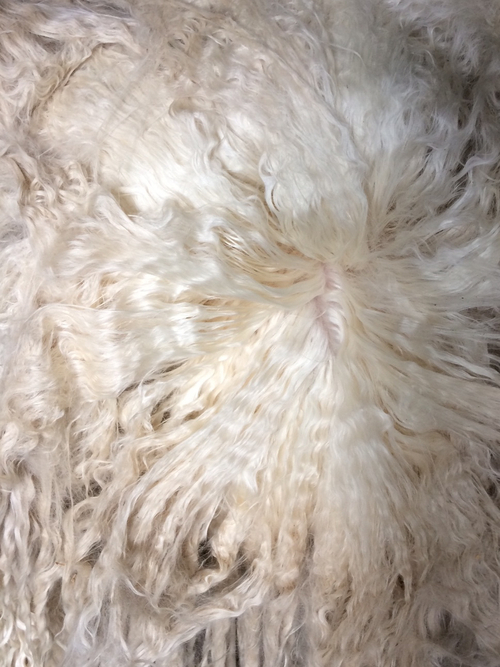 She holds great fiber stats for her age including top 1% in 2016 EPDs for fleece weight. Alejandro is proven!! HIs first 2018 offspring hit the ground on July 28th courtesy of Goldyn Rae's Nazca (owned by Hasselbring's Harmony Ranch). 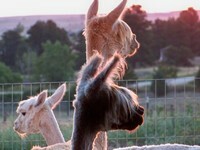 The new male cria is beautiful! 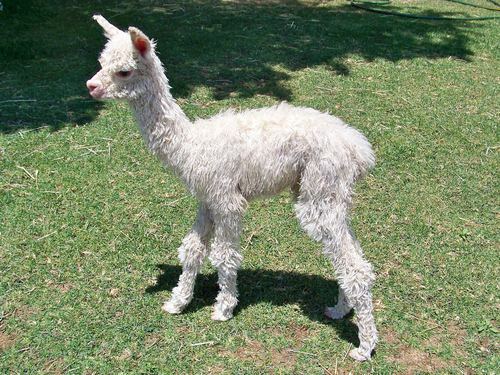 Born at 21 pounds, he has long and straight legs, is wrinkled-skin, and sports highly lustrous fleece. Contact us now to book your breedings. These genetics are rare in this part of the country! This male can add density, luster, substance of bone and fineness to your herd. Book your breeding today! Package deals available. Daughter from Mont Blanc Son Alejandro! Amazing male from Mont Blanc Son! BIG Male from Mont Blanc Son! Female from Mont Blanc Son Alejandro!